We offer Original Manufacturer Auto Glass products that meet all safety and quality standards and specifications. We will beat any competitors advertised price by 10%. *The competitors auto glass must match our Original Manufacturer quality auto glass products and lifetime parts and workmanship warranty. We pay up to 100% of your auto glass deductible and deal with your insurance claims, ensuring your insurance covers the windshield replacement and not you. We offer mobile auto glass replacement and repair at no extra charge anywhere in Brampton. Unlike other big brand auto glass shops we are 100% Canadian owned and operated.By doing business with Brampton Auto Glass you are helping the Canadian dollar and economy grow. #Support Local. If your vehicle is located in Brampton ON, you can take advantage of our No-Extra-Charge Mobile Auto Glass Service. We are able to replace all makes and models of auto glass on-site using our industry leading-fully equipped mobile auto glass trucks. Our trained mobile technicians will drive to your premises and replace the windshield on your premisses. 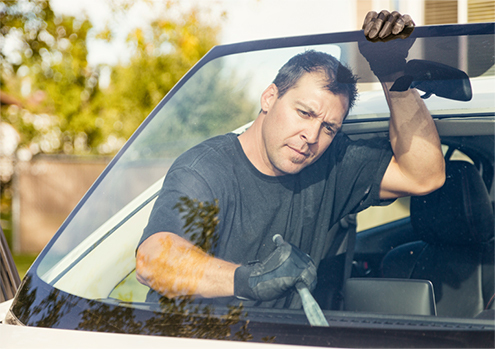 We offer commercial and residential mobile auto glass replacement. Brampton Auto Glass will always attempt to repair any repairable auto glass chips on your windshield before suggesting do do a complete auto glass replacement. This is the standard in the auto glass industry and our business is built on the foundation of fair and honest work. If the rock chip on your windshield is classified as repairable, this means that the structural strength of the windshield has not been compromised and Brampton Auto Glass will attempt to repair it using our industry leading eco-friendly auto glass chip repair technologies. In most of our clients cases the insurance deductible will pay for your windshield chip repair, which means is free free for you. Call to find out if your auto glass chip can be repaired or the entire windshield must be replaced. We carry most vehicle makes and models in stock. We offer a lifetime warranty against any manufacturer defects. We offer the highest quality auto glass products in Canada. All our auto glass technicians are highly experienced and certified. We replacement windshields within 45 minutes. We offer free mobile auto glass replacement in Brampton. We pay up to 100% of your auto glass deductible. In order to offer the lowest prices on top quality OEM auto glass products Brampton Auto Glass stocks its warehouse with the most popular makes and models of vehicle glass including: Acura, Audi, BMW, Buick, Chevrolet, Chrysler, Cadillac, Chevy, Dodge, Ford, GMC, Honda, Hyundai, Infiniti, Jaguar, Jeep, Kia, Lincoln, Lexus, Lotus, Land Rover, Mistubishi, Mercedes-Benz, Mazda, Mustang, Mercury, Mini Cooper, Nissan, Oldsmobile, Pontiac, Porsche, Range Rover, Subaru, Suzuki, Smart Car, Shelby, Saturn, Saab, Toyota, and Volks Wagen VW.